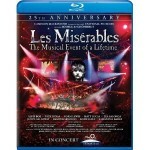 From Universal Studios Les Miserables will celebrate 25 years with a release on hi-def Blu-ray Disc next month. The disc contains 2 hours and 50 minutes of content from a recorded live show starring Nick Jonas and Lea Salonga. The Blu-ray Disc is formatted with a 1.78:1 widescreen aspect ratio and English Digital Dolby 5.1 soundtrack. Les Miserables: 25th Anniversary was recently released as an import on November 30, 2010 with an MSRP of $56.98 (although the import edition is currently out of stock and hard to find). 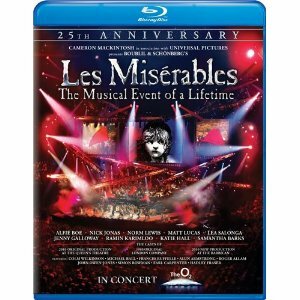 This new release of Les Miserables carries an MSRP of $39.98 (about $27.99) and will hit stores Feb. 22, 2011. From award-winning producer Cameron Mackintosh (Phantom of the Opera), Les Miserables is undoubtedly one of the world’s most popular musicals and has been seen by nearly 60 million people around the world. The live recording of this extraordinary 25th anniversary show is an awe-inspiring event starring Nick Jonas from the Jonas Brothers, Tony Award winner Lea Salonga (the voice of Disney’s Mulan and Princess Jasmine), and over 500 additional artists and musicians! Les Miserables won eight Tony awards including Best Musical, two Grammy awards and five Drama Desk awards. Critics are raving that Les Miserables is “an unquestionably spectacular production from start to finish” (Anita Gates, The New York Times) and debuts on February 22, 2011 on Blu-ray, DVD and Digital Download from Universal Studios Home Entertainment.